So, you saw the videos, bought access, but cant find your way out of the controls menu? This is the guide for you, which will cover all the basic controls, their usage and general advice for enjoying the current version of pre-alpha. The first thing you’ll see after the updator is this launcher. There are a few options for you here, first you will want to set your callsign, this will be your name in-game. 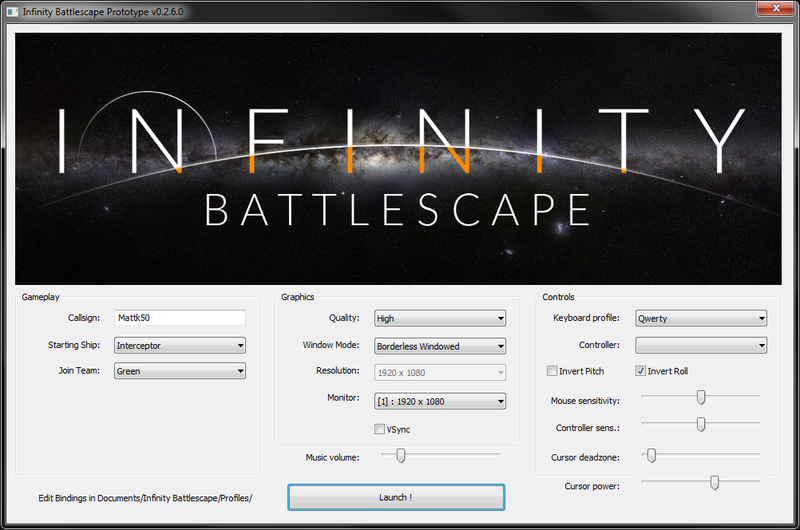 Set your monitor resolution and your preferred window mode (borderless windowed is a good choice). If you notice low framerates you can come back here later and turn down the Quality setting to medium or low. You can also pick the ship you will initially spawn in with, but stick with the interceptor until you have a handle on the controls. If you ever find yourself wanting to switch teams this is also where you go to do that. Launch the game to get started! You have the option of using gamepads and joysticks, but for the current pre-alpha setup is complex. See this thread for more information. The movement controls are highlighted in blue and red on the controls image. Red controls in the control helper correspond to setting a throttle setting, lower to the left higher to the right. If you press “1” or scroll down on the mouse wheel all the way, you are ordering your ship to try to stop. If you press “0” or scroll up, you are setting your ship to max speed, around 50km/s. Usually in combat you will only need 1-5 at most for the throttle, as the higher settings are incredibly fast! Blue corresponds to thrust and roll controls, these controls dont “set” you to a speed, but are an instant movement in that direction and override the throttle, press forward and you’ll be pushed forward until you let go. Similar to an FPS and other standard pc games, WASD will move you forward, backward left and right. Where things get tricky are [Q], [E], [R] and [F]. [R] and [F] are your up/down strafe controls similar to left and right, with WASD+RF you can move freely in any direction you want, and combine them to get in-between directions. Roll with [Q] and [E] will “spin your camera” and can be useful for leveling out your view and getting your guns in line. Simply move your mouse up down and left or right to tell your ship how fast to rotate in that direction. Most of these tools are not needed for a player just starting out, but eventually you’ll probably want to start mastering the “six degrees of freedom” to fully enjoy the newtonian spaceflight so it’s good to know. For now, you’re ready to start playing with just your mouse, W for forward and S for reverse. The first thing you’ll need to do is close the help menu so you can see whats happening after you power up your ship. Press either Esc or F9 to do this. Next you will want to power up your ship. To do this, press and hold the [V] key to open the radial menu then move your mouse left, hovering over the power option, and let go of [V]. This menu and the other menus in [x], [c] and [v] are all useful and all controlled this way. You can also press P to power on your ship. Try not to crash! Next, you’ll want to exit the hangar your ship spawned in. To do this, hold w to move your ship forward. Because your throttle is set to zero by default, if you let go of w it will let go. You can turn with the mouse and you should be out into either the great darkness of space or a planetary surface in no time! Consider noting how the hangar you spawned in looks. You can return to it to repair and rearm your ship, note only pads that match your ship’s size can be used. Uh oh, there’s a good chance right outside the relative safety of your station is one or many enemies ready to murder you. Don’t panic! The first thing you will want to do is make sure you keep moving! A stationary target is an easy target to hit. Your second concern will be targeting a suitable opponent to shoot at, to do this press T to target an opponent you are looking at, or G to target the enemy closest to you. Note that the closest enemy to you might be behind you! In the interceptor, you have two types of projectile weapons and a guided missile rack. With an enemy targeted, you will see two reticles, one yellow and further away, and one white and closer. Your goal in combat is to fire your weapons at the enemy ship, and acceleration prediction reticles help show you where to fire to land hits on an often distant, fast moving target! On the interceptor, you have fixed weapons which fire in-line with the nose of your ship marked by an X with a dot in the middle in the center of the cross-hair. It’s that X you will shoot from. Your opponent probably still has his shields up, so you want to start with your blasters! Move your nose over the yellow reticle and Press your secondary fire button (right click/mouse 2) to fire your energy weapons at them! 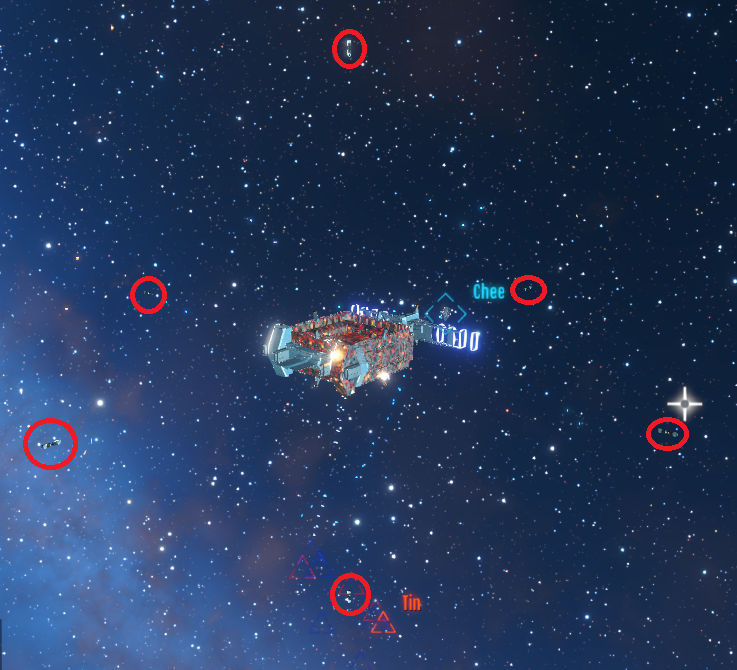 If you get their shields down, move to the white reticle and your cannons with your primary fire (left click/mouse1). 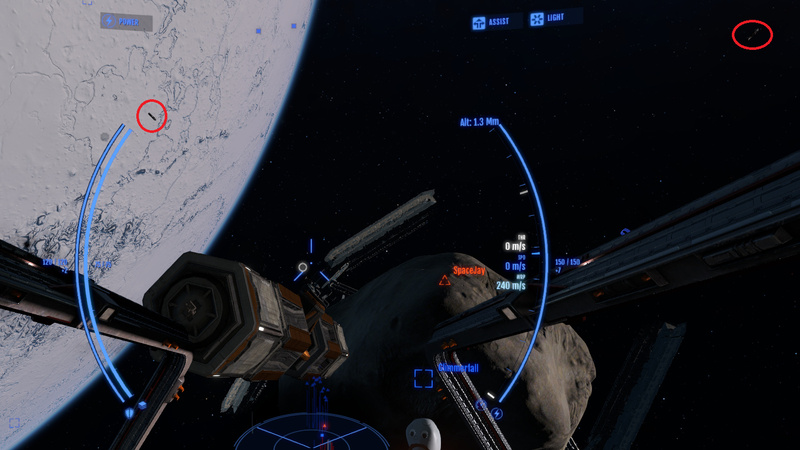 Landing hits will depend on your positioning and relative velocity, try to stay close and keep them “stationary” on your screen for an easy shot. Use the “relative velocity” indicator under the target box, try to stick to 10% of the distance you’re trying to close to make sure you don’t overshoot. This means if you’re 10km from a target, try to have that number at -1km/s, and slow yourself down to a relative 100 -m/s as you approach 1km. This can be difficult, especially playing a Newtonian space combat game for the first time, it’s like re-learning video games! Don’t fret if you can’t land hits right now, it’s something to work on in the future. For now, you have missiles! To lock a missile point your ship’s nose at the target’s reticles until the target lock sound ends, then press the fire missile button (Right ctrl). Try to be within 5km when firing missiles, too far away can make the missiles very easy to evade. Some players find using the “match speed” assist useful and some players prefer no assist at all! Feel free to experiment with these options in the radial menus. Moving between Battlescapes including moons, stations and other objects would take a very long time using conventional propulsion, so you will need to use warp. Going to warp is straightforward, make sure you are pointed in the direction you are moving (see the “direction indicator” on the HUD to line up with), and press either J, or hold V and select warp in the radial menu. Warp is fast! To help you control warp your ship will automatically slow down near objects, but even so it’s still fast. You will want to use the number keys and the mouse-wheel to set your warp throttle to something reasonable, don’t let yourself wait 10 minutes to arrive where you’re headed but also don’t try to get there in 10 seconds and overshoot. If you do overshoot, either slow way down or drop out of warp and attempt another approach. This can take some practice. When you’re ready to leave warp, either press J or use the V radial menu to disable warp. You will exit warp instantaniously with the same velocity you entered warp with and proceed normally with Newtonian thrust. On the bottom right hand corner of the screen is the location the AI commander is currently directing you to, this is often a safe bet for fighting a fight. If you go to that location and aren’t finding the type of fight you’re looking for, there are currently occasional chat messages which list the most active battle locations in order, try any of those. Once you’ve found the name of the base/station(underlined in blue) and the planet(underlined in red) it’s around, you can either use U and Y to scroll through the available targets until you find what you’re looking for, or physically look around and target things under your pointer with T until you find the planet or moon you’re looking for, approach that, then look for the specific base and approach that. As an interceptor the way you can be most useful to your team is to, between fighting other ships, find turrets on enemy bases and destroy them to clear the way for your team’s capital ships. Doing this also has the benefit of making you lots of credits to upgrade ships later. To destroy them, you will want to use your kinetic weapons (mouse 1) to shoot at them until they’re destroyed. You can also “dumbfire” your missiles at them though this is less effective lately. Be careful, when dumbfiring missiles, the missile inherits your speed so if you’re moving left, right, up or down your missile can go wide! To fire a missile dumbfire, press X and toggle the “safety lock” option off, this will make it so when you press “fire missile” your ship will fire a missile whether or not you have a target locked. This is useful for bombing runs on Base or Station turrets. 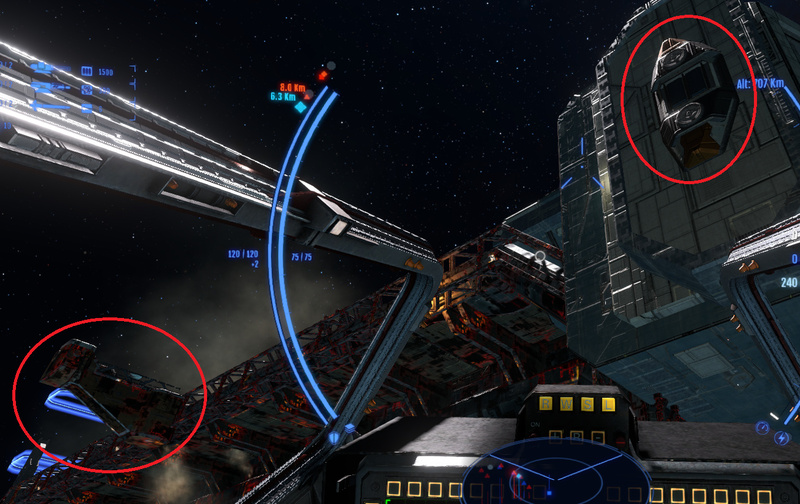 If you find yourself in a ship capable of doing more damage to structures like a bomber, destroyer or cruisers, try to make note of enemy spawn gantries, reactors, and other vital station components. The UI for this is a work in progress, but basically you want to bombard them until their texture changes to an obviously damaged state with explosions, this indicates you’ve destroyed that segment of the station. Destroying specific modules will have specific effects, and if you destroy enough the whole station will be destroyed. Approaching a planetary atmosphere at warp can be difficult, and it can be annoying to be forced out of warp before you’re closer to your destination. Atmospheres impose a speed limit on both warp and conventional travel, going faster can damage and destroy your ship. 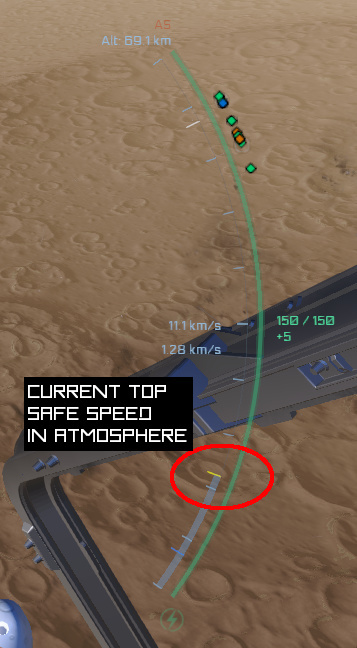 To prevent being kicked out of warp by safety systems you need to keep an eye on the atmospheric speed limit on your speed bar, pictured here. The position of the yellow line will shift with altitude, with the speed limit high in the thin outer limits of the atmosphere and low in the dense atmosphere close to the ground. When approaching a planet ensure your current throttle level is lower than the yellow line in order to navigate atmospheres with warp. How do you resupply missiles from stations? Or is that not something you can do yet? there isnt any repair or resupply at stations (or carriers) yet, the only resupply mechanic implemented so far is the corvette dropping ammo boxes. When we get working station resupply adding a section on repair/resupply is probably a very good idea though! Just an update for new readers, corvettes do heal now. They emit a green aura and being near them will repair your hull. Matt can do a proper write-up of this later. My go-to targets are the floating platforms around stations (250 credits each), farmable with little risk in a destroyer but not very difficult in an interceptor either. Furthermore, they are far away from each other so you to dodge only from one direction. One up close and others in the distance.